Turmeric and black pepper is very beneficial for health. Turmeric contains many anti-microbial and anti-inflammatory properties. Black pepper avoids cancer, reduces weight and beneficial in gas and skin. 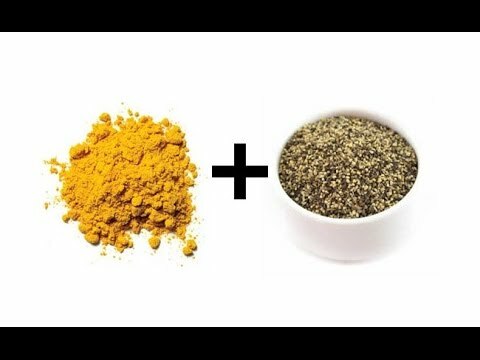 The mixture of turmeric with black pepper is beneficial for health. Take 100 gm raw turmeric and 50 gm black pepper. Daily drink this 3 gm mixture with fresh water. Black pepper contains Piperine that restricts liver from removing curcumin from the body. This slow down the metabolism. It protects the enzymes. Turmeric contains polyphenol that reduces stress and protects the cells. Anti Ageing: The regular consumption of turmeric with black pepper helps to fight against free radicals. This reduces the aging on the body. Blood: The regular consumption of turmeric with black pepper cleans the blood. It is beneficial for good skin. Stomach: The mixture of turmeric with black pepper is extremely beneficial in stomach problem. It is also beneficial in joint and muscles pain. Detox: The mixture of hot water with lemon, turmeric powder and honey is beneficial to detox the body.